As we near the final round of a historic election, we must ponder over issues that are far more important than keeping a tally of the political debating points scored by rival camps. Last week, my husband and I had to go to Bareilly for a family wedding. Interestingly, even though it is one of the most important towns of UP’s Rohilkhand area, Bareilly still remains curiously ill-connected by train. A charismatic Priyanka has once again come to lift the flagging Congress. She is countering Modi’s remarks ably and with dignity. I love the jungle, I always have. There is an unpredictability about it that is just beautiful. You never know where and when you will encounter the life you ought to live — untamed and feral. Everything is defined only by its own existence. While Sonia will be held responsible if the Congress suffers an embarrassing defeat, we do need to acknowledge that she has always conducted herself with grace and poise. While the focus so far has been on the exit of Prime Minister Manmohan Singh, little has been said about the future of Congress President Sonia Gandhi. With opinion polls predicting that India’s Grand Old Party will face a humiliating defeat in the General Elections, much of the blame would also have to be shouldered by Sonia, as she was seen to be the real power behind the throne. Last week, my husband and I had to go to Bareilly for a family wedding. Interestingly, even though it is one of the most important towns of UP’s Rohilkhand area, Bareilly still remains curiously ill-connected by train. As a young university student, I remember going by a meter-gauge train from Kathgodam to Bareilly, then changing trains at some god-forsaken hour for a connection to Lucknow where we had to change trains yet again to reach Allahabad, my university destination. Naturally, the journey was a nightmare, Bareilly was then famous for ‘Hashim ka surma’ and its ‘goondas’ and we were warned by parents and well-wishers to keep well out of harm’s way. The railway waiting room, where we awaited our next train connection, was a bare cell of a room, with a ferocious woman attendant who kept the peeping toms at bay. Readers who have seen the film ‘Jab We Met’ will understand what kind of creepy denizens haunt deserted railway platforms at night. Little has changed for ‘Bharat’. To come to the present: it was a pleasant surprise to find that the National Highways Authority has made travel to that part of the world a smooth experience. The tourist laybys are now a far cry from the fly-ridden ‘dhabas’ (with no toilets). I remembered from a similar trip 14 years ago. The hair-raising traffic that we once drove through when passing through mandi-towns such as Hapur and Muzaffarnagar are no longer impediments after the NH-24 was made into a smart highway. So far so good. It was only when we entered (or tried to enter) Bareilly that the reality of small-town UP hit us. The orderly traffic on the highway joyfully turned into a free-for-all, with bullock carts, two-wheelers, tempos and buses trying to dodge each other to reach their destination first. Shops spilled over into roads, I saw men bathing on pavements, children darted like rabbits across the crazy traffic and it is a wonder that no one died. Where graffiti on ‘qasba’ walls once offered ‘rishte hi rishte’ or magical cures for unmentionable ailments, there are now bright colourful ads for computer classes, English-speaking courses, nursery schools and educational institutions. Every little town is booming with dental, medical, IT colleges and universities that seem to sprout like wheat in the middle of farmland. In fact, the Muzaffarnagar Institute of Technology proudly announces itself as India’s MIT and Moradabad has apartment complexes built by famous builders arising like lotuses from the surrounding mud. Beauty parlours, jewellery showrooms (with a cheerful disregard for correct spellings and grammar) are announced from huge billboards as you enter the city. Restaurants vie with each other to offer tempting deals for ‘spaciel ocassions’ like ‘kitties’ and ‘waddings’. Everyone now recognises that Bharat and India are two separate entities. However, what is even more important to remember is that the rising levels of confidence in Bharat are in inverse proportion to India’s despair. Like spoilt children, we city slickers bemoan the lack of municipal facilities: Bharat has learnt to live without them and still get on with the business of making good. Of course, they want potable water and reliable electric supply but no longer will they sit back and wait for some miracle to grant it to them. The old havelis of the erstwhile aristocracy are being torn down to make place for crowded settlements. Hardly any old family has ploughed back its riches into the city: their children have long migrated to the metropolitan cities or gone abroad and return only to fight civil cases against squatters and building sharks. Small-town India is now firmly in the grip of a new class of entrepreneurs who have given up on the government and law. And just as a parallel economy has kept large parts of the country afloat, a parallel system of governance has sprouted up that is tailored to the immediate demands of a customer. Want to build a house but don’t have the papers and permissions? No problem. A tout will handle it for you for a fee. This is what has accounted for the breakdown of the civil administration all over the state. Strongmen, ‘bahubalis’, ‘goondas’ — call them what you will —these are the ‘mai-baap’ of the common man now. The delivery system they preside over is more reliable as it has the political protection of the local netas. As we near the final round of a historic election, we must ponder over issues that are far more important than keeping a tally of the political debating points scored by rival camps. What is the system that we are voting in? Is the present election in any real sense a victory for democracy, or is it simply a superbly efficient and fair exercise conducted by the redoubtable Election Commission in the largest democracy of the world? Is something really going to change the political climate or is this our version of a public carnival that, like the European Feast of Fools or our own Holi, provides all Indians to be equal for once. Where the vote of the sahib is at par with that of the ‘sevak’ and when, for a brief moment, the common man and woman is given the dignity and respect he/she deserves? I love the jungle, I always have. There is an unpredictability about it that is just beautiful. You never know where and when you will encounter the life you ought to live — untamed and feral. Everything is defined only by its own existence. Animals are what they are — unabashedly themselves,” says Priyanka Gandhi Vadra in “Ranthambhore: The Tiger’s Realm”, a coffee table book she has co-authored with friends Anjali and Jaisal Singh. Priyanka was obviously not referring to the jungle of Indian politics, which, at the moment, she seems to be loving equally. Congress star campaigner Priyanka is clearly the only person in the party fraternity who has been able to skilfully counter Modispeak consistently with clarity, connectivity and elan. Sample this: “Yeh Bharat desh hai jise chalane ke liye chappan inch ka seena nahin, dariyadil chahiye, (To rule the country one does not need a 56-inch chest but a kind heart)” she said referring to BJP prime ministerial candidate’s much-touted chest. Taking on Modi, she retorted: “Kabhi ABCD, kabhi RSVP, kabhi ‘d’ se desh, kabhi ‘k’ se kaua. Kabhi ‘b’ se bas bhi toh kariye! Aap kisi prathmik pathshala ko thode sambodhit kar rahe hain! Yeh desh ki janta hai. Janta mein vivek hai (Stop using abbreviations like RSVP — Rahul, Sonia, Vadra, Priyanka. You are not a schoolteacher. You are talking to the people of the country who are discerning). She reacted most sharply to the BJP’s booklet and videotape titled “Damaad Shri” on her husband Robert Vadra: “Yeh (BJP) baukhlaye hue choohon ki tarah bhag rahe hain. Jitna karna hai kar lein. Main kisi se nahi darti. Main inki vinashak, nakaratmak aur sharmnak rajniti pe bolti rahungi (BJP is behaving like panic-stricken rats. I challenge you to do whatever you want. I am not scared and will speak up against their destructive, negative and shameful politics). Priyanka is determined to take on Modi’s electoral rhetoric. Single-handedly, she is giving it back to the Modi brigade in a language understood by the common man, devoid of spite. Whichever way the country’s politics goes post-May 16, one thing is clear that from now on, the question would not be Rahul or Priyanka, but Rahul and Priyanka in Congress circles. Congressmen who have been observing her for many years say she is “dadihaali” (taking after the father’s family) compared to Rahul who is “naanihali”. 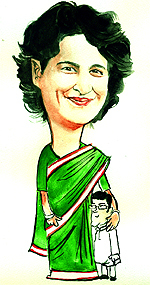 Like her grandmother Indira Gandhi, Priyanka emerges the strongest when pushed to the wall. She is protective towards her family and says she would go to “any extent” to help out her brother. Proving once again that she was like her grandmother, she had remarked: “Yahan aane se pehle maine apni maa se baat ki thi. Maa ne kaha kisi ki burai mat karna. Magar main jawan hoon, dil ki baat aap se na kahun to kisse kahun?” (Before coming here I spoke to my mother who advised me against speaking ill of anyone. But I am young; if I do not share my feelings with you, whom shall I speak to?) Her gumption had sealed Nehru’s fate forever. In the 2014 elections, Priyanka has limited her campaigning to the twin constituencies of Rae Bareli and Amethi. Her hard-hitting retaliation has rescued the Congress campaign from derailing. Ten years ago, Rahul, and not the more charismatic Priyanka, was Sonia Gandhi’s choice when the time came to take up the family mantle. To why Priyanka was not taking on the responsibility, Sonia had asserted that she was fulfilling the most important duty of nurturing a young family. The hands-on mother to Raihan and Miraya, Priyanka is now less burdened with responsibilities as her son is in a boarding school and daughter is expected to follow suit. Congressmen believe that now she would shoulder more responsibility in the party. In the face of an adverse verdict, they expect Rahul to take on the government inside Parliament and hope the party to rally around Priyanka as Sonia goes into retirement mode.